The 3rd ASFAA Sport for All Training Course (Training Course) was successfully held between 24 and 26 May 2015at the dedicated ASFAA Training Centre in Macao, China. 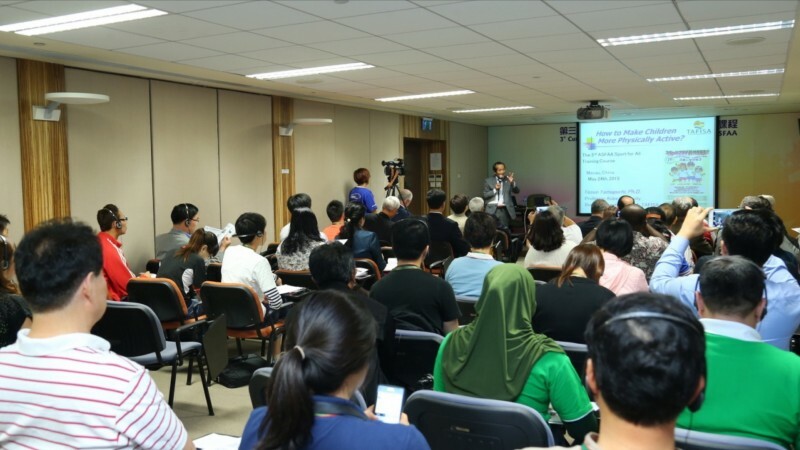 The Training Course was attended by 70 participants from China, Indonesia, Iran, Korea, Chinese Taipei, Hong Kong and Macau. The aim of the Training Course was to provide a structural and practical training to personnel involved or about to engage in the field of Sport for All. The theme of this year’s Training Course was “Sport for All and Youth Development”. Interactive and informative training sessions were delivered by experts from academic institutes and sport for all organisations from China, Australia, Great Britain, Hong Kong, Japan and Portugal. For details of the topics presented, please refer to the appended programme. During their stay in Macao, the participants were also given the opportunity to explore the cultural heritage of Macao on an excursion to the UNESCO World Heritage sites of Macao,organized as part of the social programme. The 3rd ASFAA Sport for All Training Course concluded with a gala dinner held at the Galaxy Macau on 26 May, during which certificate of participation was present to all the participants who have successfully completed the 3-day Training Course. Through the training course, the participants were able to enhance their understanding of the Sport for All movement, the challenges faced and to draw on the experiences and ideas of the speakers and each other to develop and implement sport for all related programme in their own country and region. ASFAA would like to convey our appreciation to Macao Sport Development Board for its wonderful organization of the event and to the Macao SAR Government for its unrelenting support to the development and promotion of Sport for All in the region.